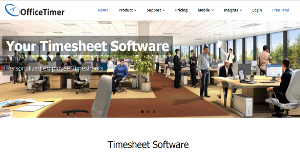 OfficeTimer is a a robust and full featured time management platform that is composed of the following modules: Time Tracking & Timesheets, Leave Management System, Expense Management, and Project & Task Management. Boasting of an extensive set of advanced features and very budget-friendly packages, OfficeTimer has been a key component in helping thousands of employees around the world improve their productivity and boost the billing efficacy of companies by approximately 10-15%. What sets OfficeTimer apart from similar scheduling platforms is that it enables companies to track time spent on each project, and set them against planned efforts and profitability projections. Timesheets, bills, and expenses are all gathered and displayed in a single interface, making it easy for users to access and interpret figures almost instantly, helping them make smarter business decisions and steer their business to success. OfficeTimer that does a lot more than being just a time tracking platform For one, the system helps businesses and teams significantly improve their efficiency. This is achieved by monitoring the number of hours spent by employees on their work and comparing them to the actual expectations, plans, and long-term missions. The system integrates core elements and capabilities of Leave Management System, Expense Management, and Project and Task Management on top of its time tracking functionality. This enables OfficeTimer users to be in full control of their leaves, create fully optimized schedules, and effectively allocate their available resources and manpower. It is important that businesses don’t go overboard and beyond their budget and OfficeTimer provides users with an expense management platform to help them manage their budget, monitor expenses, and make the smartest decisions when it comes to money. With OfficeTimer, users are able to make a more viable, realistic and clear framework that makes it easy for employees to know their tasks and designations, as well as set up deadlines, appoint fixed approval bids and processes. This kind of structuring and time tracking encourages accountability at all levels, empowering each employee and the whole team to be more productive and effective. Also, OfficeTimer is fully optimized for mobile platforms, enabling users and employees to instantly access the system using their smartphones or tablets anytime, anywhere. Each enterprise has different needs and requires a software that can be personalized for their size, type of staff members and customers, and the particular industry they are in. For these reasons, no software can provide perfect features out-of-the-box. When you try to find a software system, first be sure what you require it for. Read some OfficeTimer reviews and ask yourself do you desire basic features or do you want complex functionality? Are there any industry-specific features that you are looking for? Obtain the answers to these questions to aid your search. There are plenty of factors that you need to consider and these include your budget, specific business needs, your company size, integration requirements etc. Take your time, check out a few free trials, and finally choose the system that offers all that you require to improve your organization competence and productivity. How Much Does OfficeTimer Cost? We realize that when you make a decision to buy Employee Scheduling Software it’s important not only to see how experts evaluate it in their reviews, but also to find out if the real people and companies that buy it are actually satisfied with the product. That’s why we’ve created our behavior-based Customer Satisfaction Algorithm™ that gathers customer reviews, comments and OfficeTimer reviews across a wide range of social media sites. The data is then presented in an easy to digest form showing how many people had positive and negative experience with OfficeTimer. With that information at hand you should be equipped to make an informed buying decision that you won’t regret. What are OfficeTimer pricing details? What integrations are available for OfficeTimer? If you need more information about OfficeTimer or you simply have a question let us know what you need and we’ll forward your request directly to the vendor.